Turn heads at this year prom in this statement making long Sherri Hill prom dress 52949 adorned head to toe with glimmering bead work. This stellar gown features a fitted bodice with a high neckline, draping off the shoulder rows of beading and cut out back. 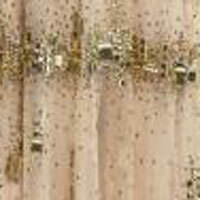 The form fitting long skirt is completely embellished with beading that drapes and a sweep train. See the entire new Sherri Hill collection at PromDressShop.com.